From the wicker chairs of the 1920s, the evolution of airplane seats has rapidly diverged in two different directions — toward luxurious full-sized beds on first class international flights and the increasingly tiny torture devices in economy. Clearly, what’s happening in the air parallels growing class schisms on the ground, but what makes air travel unique (and often, uniquely rage-inducing) is the juxtaposition of these elements within the same confined space, all set against a backdrop of general travel stress and anxiety. 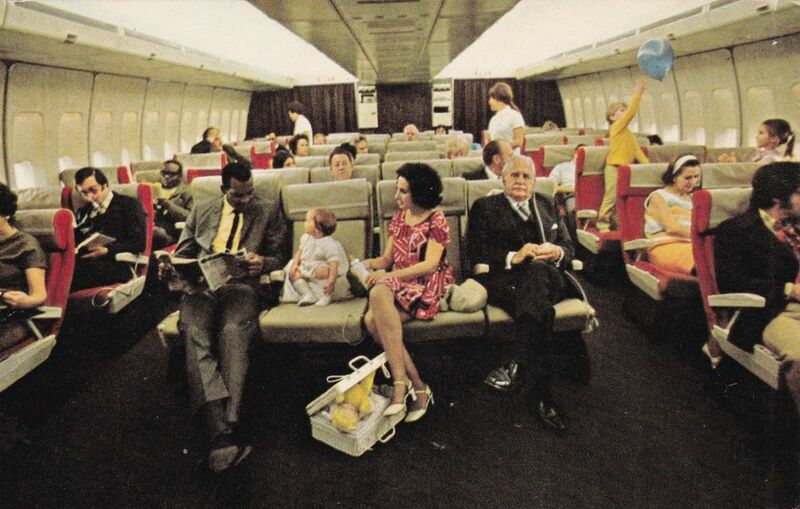 Designers for Boeing and manufacturers of interior airplane components like seats will tell you that most planes have become safer and more comfortable over time, pointing to the earliest days of random furniture scattered around low-ceilinged spaces and turbulent flights that took many times longer than they do now. But when most contemporary travelers think about how flying experiences have changed, our points of reference are much more recent, recalling the “golden age of air travel” between the 1950s and 1970s. 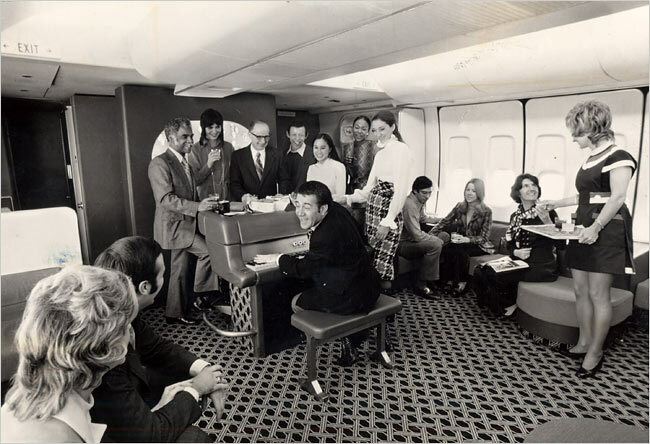 We can either summon our own memories or view photographs of guests enjoying meals of wine and lobster (with real forks and knives) or swiveling around in wingback chairs to enjoy the performance of a live pianist – all on an economy class ticket. 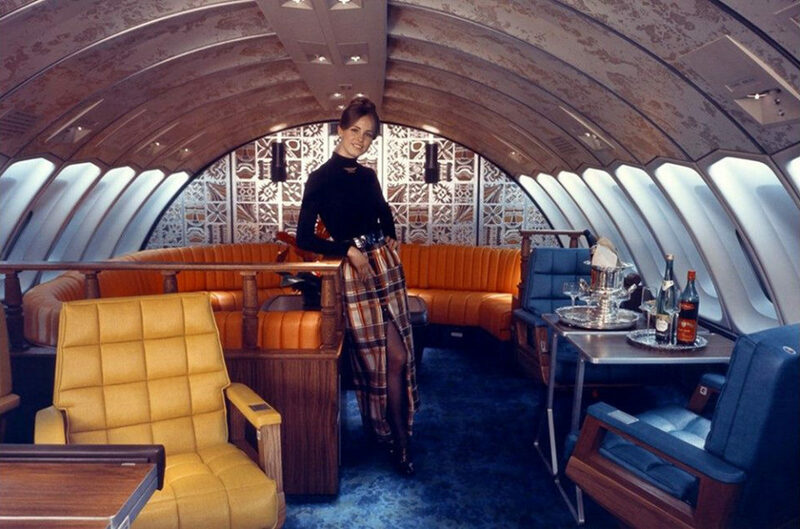 Some planes were even decked out in designs by Alexander Girard and Emilio Pucci, outfitted with murals, live plants and spacious dressing rooms. Now, for those who must wait until last to board and then march through business class trying not to look directly at all the personal space, cocktails and warm towels awaiting deeper-pocketed passengers, the cattle car endurance challenge of economy can be demoralizing. Going through invasive TSA screening and cramming yourself into increasingly tight seats with your knees pressed into your chest, only to find upon landing that your luggage has been lost, doesn’t exactly promote a cheerful atmosphere. But hey, at least people can no longer smoke cigarettes in the air. Advances in technology have offered airlines jets with ever lighter and more aerodynamic qualities, reducing fuel consumption and delivering lower operating costs, yet they’re pushed to their absolute limits to pack as many passengers in as they can. The pitch of seats – which is the distance between the front of one seat and the back of the seat in front of it – once measured 34 to 35 inches, but has since shrunk to an average of 30, with some measuring just 28 inches. Meanwhile, seat widths have narrowed to as little as 17 inches across. The FAA has declined to place limits on just how low they can go. Many passengers find that there’s no way to avoid their bodies overlapping with those of their neighbors. These measurements don’t reflect the realities of human bodies, let alone minimum requirements for comfort when you’re stuck in one position for hours at a time. Airlines are eliminating amenities, raising fees and constantly trying to pack more rows of seating onto the same planes, and some are even considering seat designs that require passengers to lean rather than sit or doing away with seats altogether, creating a whole new class of tickets that offer standing room only. 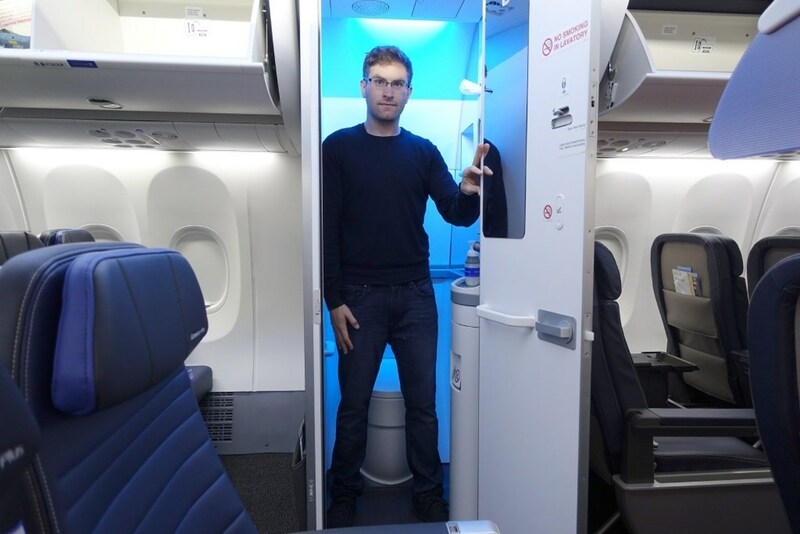 And, as interior space grows more scarce, carry-on baggage compartments and bathrooms are shrinking as well. 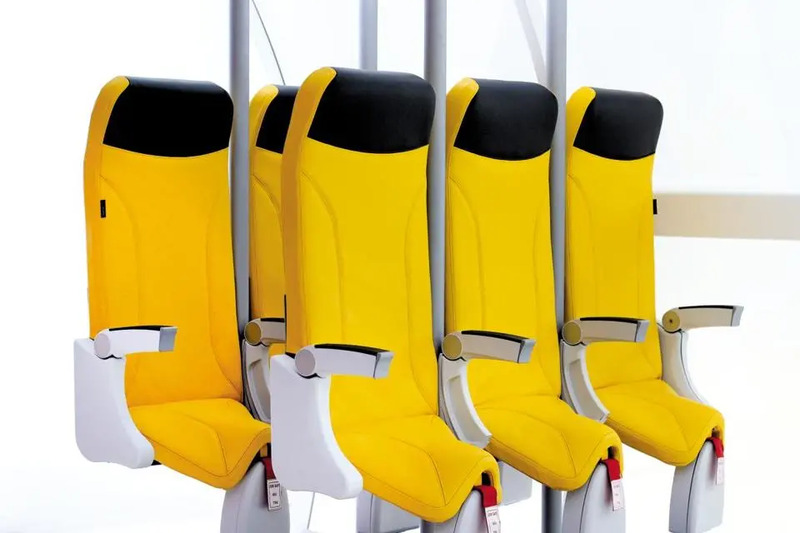 To get a few extra inches of space, you have to pay for yet another class of ticket, typically referred to as Economy Plus or Economy Comfort, or use a controversial brawl-inciting product like the Knee Defender that keeps the person in front of you from reclining into your lap. 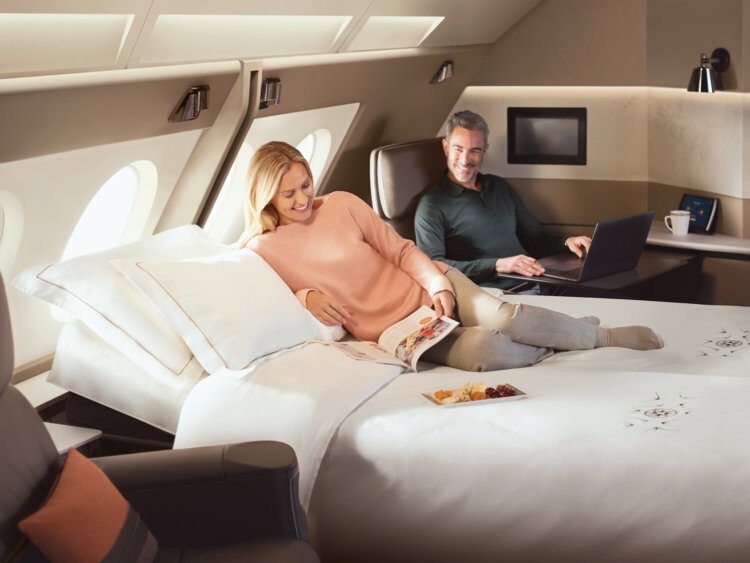 Meanwhile, in first class, airlines are competing to offer the types of amenities typically seen on private jets, like Singapore Airlines’ new A380 suites offering plush full-sized beds. 180-degree lie-flat seats, four-course meals by Michelin chefs served on china, wardrobes, desks and in-flight showers aren’t uncommon, albeit coming at a cost of up to five times as much as an economy ticket. Business class seats enjoy a width of up to 34 inches, with as much as 87 inches of pitch. How’d we get here? Some answers to that question are obvious. Airlines, like most businesses in our current economic system, have a primary goal of pushing profits as high as they can. And even in a time of record profits, thanks in part to cheap fuel, they’re working to cut costs. With most planes flying at full capacity, airlines simply don’t have to work very hard to buy the loyalty of passengers who want to pay as little as possible to travel. Plus, back in the days of luxurious amenities in so-called economy class, flights were priced high enough that only certain strata of society could afford them at all. President Carter’s 1978 Airline Deregulation Act helped democratize air travel, making it more accessible than ever, and today, fares are at historic lows – but clearly, we pay for it in other ways. We live in a world that’s crammed full of people and more traversable than ever, so the question is, how low can the base level standard of service go? Even as air travel grows more affordable, our roads and bridges are crumbling and high speed rail projects never manage to materialize, giving us few alternatives. It’s also worth remembering that even on the cheapest tickets, air travel is still a considerable expense for many people in the United States, where almost a third of the population lives at or near the poverty line. Judging by airport design alone, the future of air travel looks high tech and glitzy. But if air travel trends continue along their current trajectories, it’ll be interesting to see just how much more segregated the experience becomes for travelers of varying classes. With the middle class shrinking, the number of people who can pay thousands of extra dollars to sit in the front of the plane will likely remain as small and exclusive as ever, leading everyone else to wonder whether getting a bargain requires giving up even the most minimal comforts. Will the rear ends of planes someday look like the notoriously crammed subways of Tokyo? With our expectations of air travel experiences diminishing, perhaps renewed pushes for better transportation on the ground will emerge – which might be for the best, anyway, given the massive effect all those flights have on the climate.